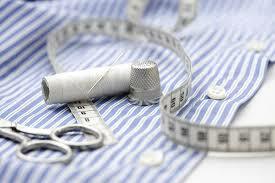 Mending and alterations for all types of garments. Skilled tailoring for all your clothing items, and give sound advice regarding your alterations,stitching and patch work. We do it all for the Jackets, Trousers, Coats and Blouses, shortening sleeves of jackets and shirts ... Waists let out or reduced, sides Tapered, Zips replaced, turning or collars, T-Shirts shortened and even alterations to Evening Dresses, Wedding Dresses, Curtains, Blinds and Bedding - etc..